Of all the packages that Hawaiian Island Weddings offers, the Deluxe Ocean Front Ka'anapali Wedding & Honeymoon has got to be the best by far. 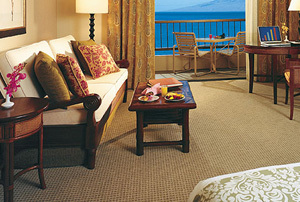 The deluxe ocean front accommodations at the luxurious Hyatt Regency Maui in Ka'anapali have to be the reason. The hotel is located on 40 lush beachfront acres on Ka'anapali Beach, voted the number 1 beach on Maui by the Maui Visitor Channel. Ka'anapali Beach fronts a string of hotels and condominiums. A relaxing beach walk connects the hotels, restaurants and bars, and the sunsets here are spectacular! Your room offers an unobstructed view of the ocean & pool as well as the islands of Lana’i and Moloka’i. Each room features a separate sitting area and lanai (balcony) from which to enjoy breathtaking panoramic views. Bedding includes one king bed with a full size sofa pull-out. Plantation-style wood furniture adorns your room, cotton duvets and Hawaiian quilt hangings give the feeling of Hawaiian opulence. The wedding & honeymoon package also includes a Mustang* convertible rental car during your stay provided by Hertz Rental Car. Conveniently pick up your rental car at the Kahului Airport (OGG) and return it on your way back home. The convertible is the most sought after rental vehicle in Maui. You can also substitute a Jeep for the convertible, for just a little extra. See rate details and other information Here. You may also order a number of additional options to make your Maui wedding even more memorable. Consider adding professional videography, additional photography, hair & makeup services, a wedding cake, musicians, hula dancer(s), limousine transportation, doves released and more. See a complete list under the Options section. Which ever package suits your individual needs & tastes, you can be assured of the top quality professionals and "Aloha Spirit" that will be shone upon you while in Maui. Maui is "No Ka Oi", meaning, Maui is Best! Hope you can make it soon! (* You must be at least 25 years old to rent with Hertz Rental Car. If you are younger we will provide you with a convertible car through another company, it may not be a Mustang).